The Air Force Academy (AFA) was established in 1970 at Dundigal near Twin Cities of Hyderabad & Secunderabad in Andhra Pradesh. 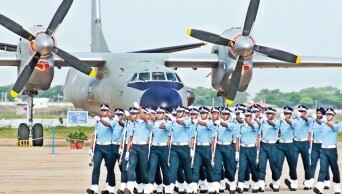 It trains Air Force Officers for Flying Branch, Technical Branch and the Ground Duties Branch. After initial training of one year the officers are sent for Specialized Training in other Training Establishment, as required. The candidate a chosen through NDA, CDSE, AFCAT and Meteorological Entries.